Playing kit, pitch markings and the rules of the game were all evolving, even as the world’s first professional football league came into being. 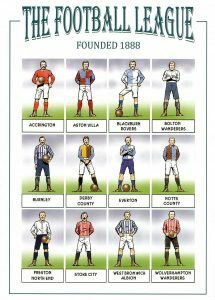 Prior to the advent of the Football League, players had to buy their own kit, consisting of heavy jerseys without any ornament, ‘knickerbockers’ covering the knees, and socks. Each club was had to stipulate its chosen colours. The requirement that no two clubs could register the same colours was dropped with the expansion of the League into two divisions in 1892, and the convention in the event of a clash was for the home team to change. The first specialist UK manufacturer of sportswear was Bukta, whose kit was worn by Nottingham Forest as early as 1884. The goalkeeper could only be distinguished from his team-mates by wearing a cap, as all played in the same kit until 1909, when separate goalkeeping jerseys were introduced, in designated colours of red and blue. The size and weight of the football was fixed by Football Association rules in 1872, stating the ball “must be spherical with a circumference of 27 to 28 inches” (68.6 cm to 71.1 cm). However the early leather footballs, stitched into panels, were notorious for absorbing water to the point where they became difficult to kick. The Football League was an opportunity for ball-makers, as well as kit manufacturers; Mitre and Thomlinson’s of Glasgow were among the first companies to capitalise on the growing market for mass-produced footballs. The invention of shin pads is credited to Sam Weller Widdowson, captain of Nottingham Forest and a Nottinghamshire cricketer, who initially adapted shortened cricket pads over his socks in 1874 and later patented the football version. Shin pads proved an invaluable protection against the metal toe-caps of the boots worn in the Victorian era, though they were not compulsory in English football until 1990. The half-way line had been introduced in 1887, to denote the limit of where the goalkeeper could handle the ball (he was still able to do so anywhere within his own half until 1912), whilst a dotted line across the pitch marked 18 yards, and a solid line 12 yards. There was no penalty box, or spot, as the penalty kick was not added to the Laws of the Game until 1891, when it was known as ‘the kick of death’ and taken from anywhere along that 12-yard line. While there had been a crossbar between the goal-posts since 1875, goal-nets were not in existence for the 1888 kick-off, being an invention of Liverpool engineer John Brodie, and introduced to League football in 1891. The formula of awarding a single point for drawn games and two for a win was not settled on until the 1888/89 season was underway; this proved to be one of the League’s most durable traditions, lasting until the introduction of three points for a win in 1981. Though in many respects the pitch and the game itself would have looked unfamiliar to the modern viewer in the first season of the Football League, both Burnley and Preston North End have stayed at the same venue to this day, while Stoke City remained at the Victoria Ground until 1997. Further testament to the League’s success is that the names of the founder members remain well-known – only Accrington (not connected to the town’s present Stanley club) are no longer in the League, and ten of the twelve original teams currently play in the Premier League or Championship.